“Children of God pray to their Heavenly Father; they do not expect others to do it on their behalf,” the General Secretary of The Church of Pentecost, Apostle Alexander Nana Yaw Kumi-Larbi, has stated. 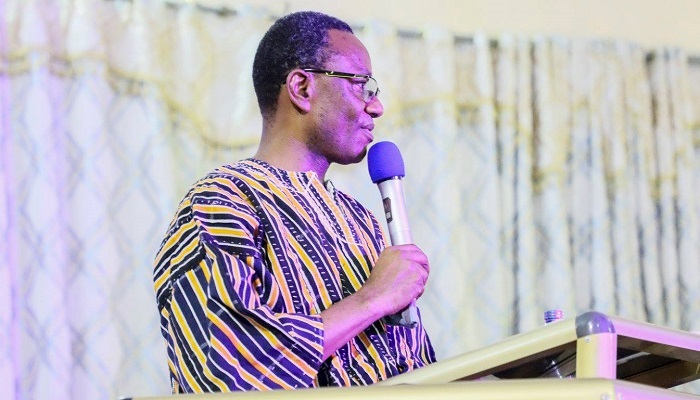 Apostle Kumi-Larbi gave this admonition on Friday, March 15, 2019 when he fellowshipped with members of the Awoshie District in the Odorkor Area of The Church of Pentecost. Speaking on the topic: “Praying To Get Results”, explained that prayer is a means of communicating and having contact with the Almighty God in Heaven. He said that as children of God, Christians must maintain and build on their relationship and fellowship with their father through consistent and effective prayer. He said that prayer is essential because Jesus admonishes every believer to pray as often as possible. “Praying is not a spiritual gift. It is available to every Christian. Every believer must learn how to communicate and remain in constant touch with their Father in Heaven. However, just like anything else, you get better with it with practice,” he said. He explained that the prayer which Jesus taught his disciples, popularly known as the Lord’s Prayer, is a prayer outline with 7 major topics, each of which represents a basic human need. He said these points serve as a guide as to how a believer ought to pray. The first part of the Lord’s Prayer: Our Father in heaven”, he explained, depicts the relationship believers have with God. God is their father, hence they are God’s children, and for this reason, they ought to believe that they would receive answers to their requests. The second part of the Lord’s Prayer: Hallowed be thy name, he said, is to give praise, worship and honour to God. This, according to him, means that Christians must always enter the presence of God or approach Him with thanksgiving, praise and worship while acknowledging who He is, what He has done and what He can do. “Your Kingdom come” and “Your will be done” parts of the Lord’s Prayer outlines God’s priorities, that is His Kingdom. The former means that the things of God, thus Righteousness, Peace and Joy in the Holy Ghost (Romans 14:17), should be established in every aspect of the believer’s life, whilst the latter means the will of God is paramount and that every believer ought to submit to the will of the Father as Jesus did at Gethsemane (Matthew 26:36-46). “The ‘Give us this day our daily bread’ part of the Lord’s Prayer emphasises God’s provision. It means we must ask God for our daily needs and not our wants, and to trust that God’s provisions are enough for our needs but not for our greed,” he noted. The next part of the Lord’s Prayer: “Forgive us our trespasses as we forgive those who trespass against us” denotes that Christians need God’s forgiveness daily and likewise they ought to forgive those who wrong them daily. He stressed that God does not answer vindictive prayers, instead, they ought to pray for your enemies (Matthew 5:43-44; Luke 6:27-28). “Lead us not into temptation but deliver us from evil” part of the Lord’s Prayer means believers need God’s guidance and protection. As Christians, they ought to pray for God’s guidance and prepare to follow His leadings daily. In addition, they ought to pray for God to put a hedge of protection around them and their loved ones (Job 1:9, 10; Psalm 91). The General Secretary further noted that the final part of the Lord’s Prayer: “For Yours is the Kingdom, the Power and Glory” acknowledges God’s divinity; that all kingdoms, power and glory belong to Him. Apostle Alexander Nana Yaw Kumi-Larbi, therefore, urged Christians to endeavour to communicate and make contact with God through daily prayer. He also advised them to pray with faith believing that as God’s children, their Heavenly Father is ever willing to meet their needs, and not to rely on others to pray on their behalf especially during trying times.